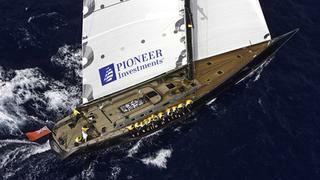 The sales team at Y.CO tell me there's been a further €500,000 price reduction on the 27.71m sailing yacht DSK. Bureau Veritas classed, this Swan 90 model was built in 2008 by Finnish yacht builder, Nautor’s Swan, with naval architecture by German Frers. She can sleep up to nine guests in a master, one double, one twin and one single cabin, along with two Pullman berths. Power comes from a 225hp Perkins Sabre diesel engine, which offers a cruising speed of 10.6 knots. Lying in Palma de Mallorca, DSK is down from €6.2 million to €5.7 million.